It has been two weeks since I was in London for Food Blogger Connect, and it’s been such fun reading the various posts by fellow speakers and participants… and tasting all the goodies I brought back with me, of course. Off I went with my lists of addresses in the capital, categorized by chocolate, ice cream, cupcakes and artisanal British products. (Yes, literally.) With only a couple of free days, friends to catch up with, fbc preparations, the Tube to master, and realizing London is, simply put, enormous, I didn’t quite get to check off as many spots as usual. Nary a fairy cake tasted, nor spoonful of ice cream savored. Not even a meringue from Ottolenghi. 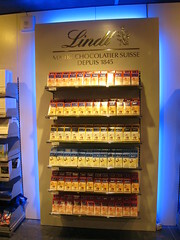 But worry not, there were plenty of chocolate stained fingers, and bars added to my chocolate drawer back home in Zürich. Some of you may have recognized the signature blue and white packaging from Rococo when I reported on my foodie weekend in England. 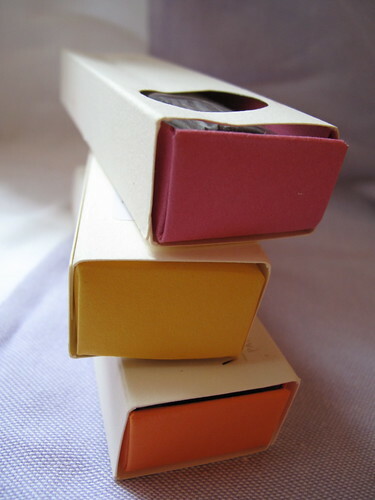 I love their boxes, but have to admit I have never tasted their chocolate. (Anyone, opinions ?) 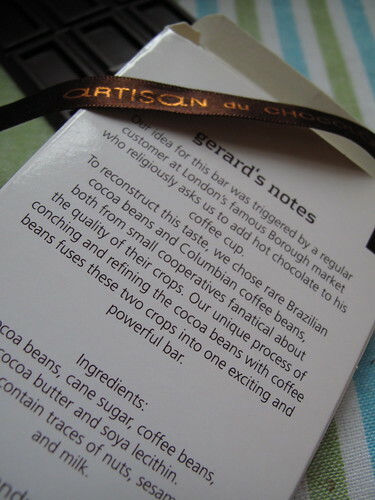 I also loved the packaging at Artisan du Chocolat. 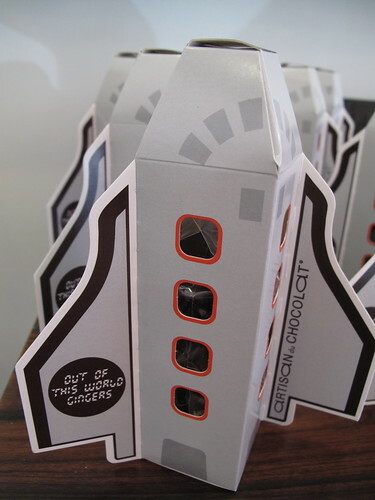 “Out of this world gingers” (below, top right) come in a rocket ship, as a nod to their flight to space in July 2009. 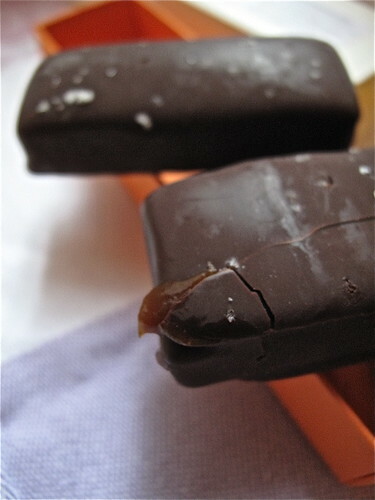 It’s fun to picture astronauts floating about, snacking on candied ginger dipped in dark chocolate. But back here on Earth, what lifted me off my feet were the liquid salted caramels, originally created for Gordon Ramsay’s Claridges in 2003. 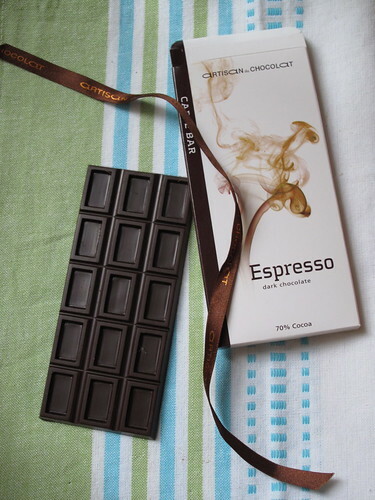 Sweet liquid caramel made with gray salt from Noirmoutier fills small, round chocolate shells, dusted with cocoa powder. You need to pop them in your mouth whole, or get ready to grab a napkin. They now come in different flavors, like banana, which was delicious. 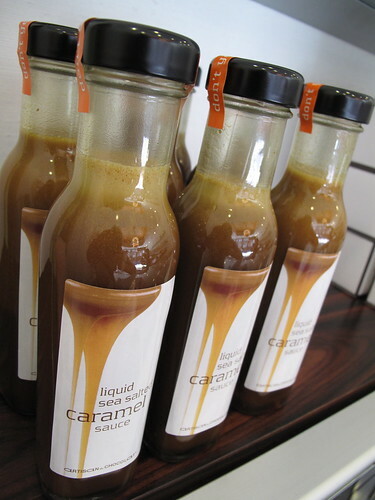 Or forgo the chocolate and just get a bottle of the caramel sauce (below, bottom left). 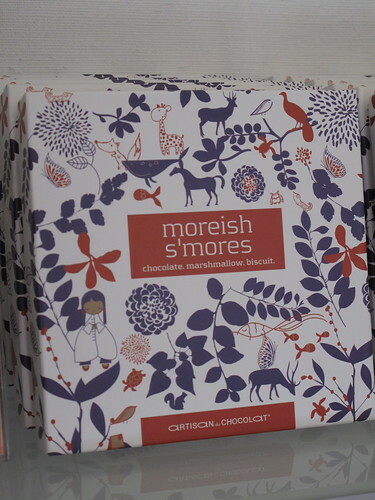 I resisted the tempation for a box of s’mores. And for the sweet and salty chocolate covered popcorn. But I had no chance leaving without a bag of chocolate dipped honeycomb. I absolutely love honeycomb – which you may know by the name hokey pokey, sponge toffee or sea foam, depending on where you live. I first discovered Cadbury’s Crunchie bar when in the UK in 1995. 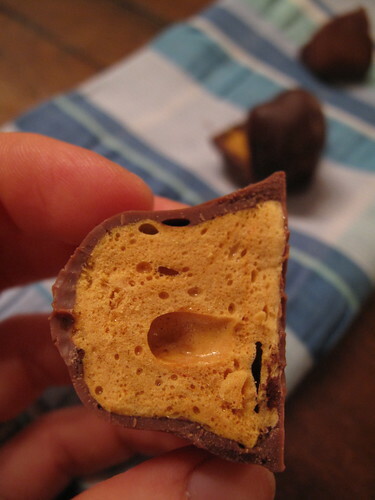 I have been making my own honeycomb ever since, partly because it’s not as widespread outside of the UK or Australia, but especially because I love to make irregular shapes, dip them in all sorts of different chocolate and then… freeze them ! [Note to self: share recipe on blog one day] Artisan’s honeycomb is exceptional, irresistibly light and crisp, and made with salt too. 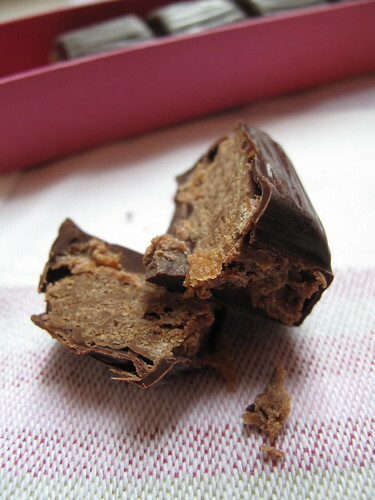 I always prefer it coated in dark chocolate, and again it worked best to contrast with the super sweet sponge toffee. The milk version was quite good too, even if the hit of the salt comes later and is more subtle. The name that was highlighted, underlined and in bold on my list was William Curley (thanks to the sweet tip from Hilda, talented photographer and fellow chocolate lover). We walked in to his bright, spacious shop and I went straight for his Snack Bars: sea salt caramel (small squares, liquid caramel), sea salt caramel mou (two larger pieces with a soft, chewy caramel center) and praline feuillantine (crispy praline wafer) in dark chocolate. I was unpleasantly surprised to see bloomed chocolate from such a high quality chocolate maker (as you can see below, top right). 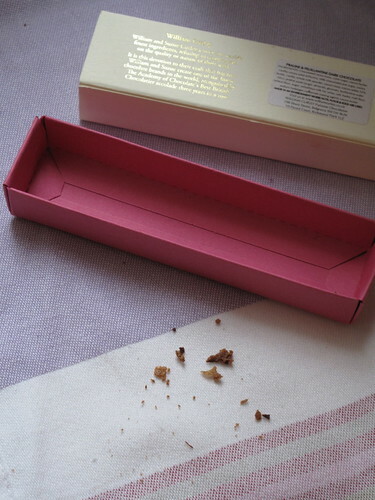 And I was further disappointed when tasting the praline feuillantine bar (unfortunately I bought two); crunchy yes, but it didn’t wow me, and it tasted overall quite heavy, too dense and not as delicate as I had hoped. A few other discerning palates have shared similarly disappointing feedback recently from Curley’s chocolates and ice cream. 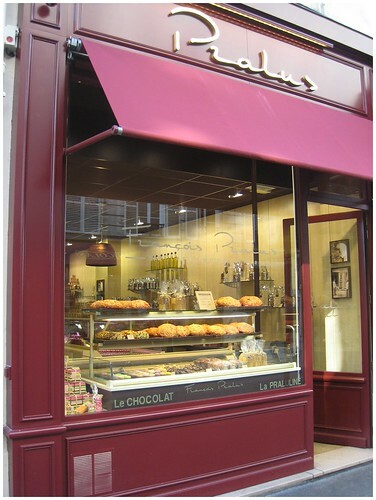 Nevertheless, I hear his pastries are quite nice and I bet his Dessert Bar is a popular spot in Belgravia. Oh, and if offered a seat in his sea salt caramel course, I wouldn’t turn it down. Ignore the price on this one (4 pounds). 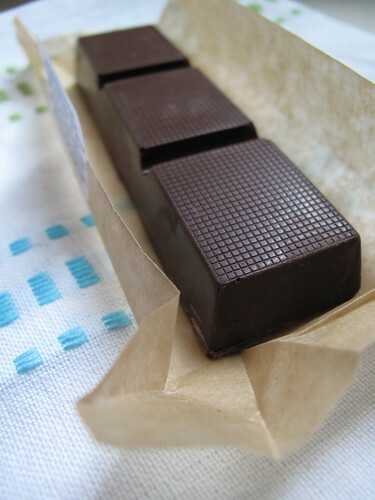 45 grams of divine sea salt caramel in thick 66% dark chocolate (they use Maldon salt). Simply look at these images below to understand the temptation. And when you taste it, you’ll also understand why it continues to reap in the awards. My only complaints: despite misleading appearances here, it’s a very small bar (disappears fast). And I would have liked there to be more caramel filling. In fact, I’d like a whole bowl of it. So what else should be on my radar for the next trip across the Channel ? Share your sweet scoop here ! Merci pour toutes ces bonnes adresses… je programme un petit week-end à Londres avec mon chéri à la rentrée… cela me sera bien utile! 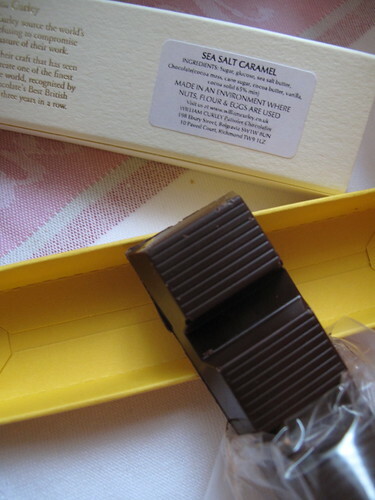 I was really underwhelmed with the caramel bar from William Curley wasn’t a fan of the caramel, I much prefer Paul A Young’s who does my all time favourite salted caramel. I actually really like Melt I love their inventive flavours. Dominique, avec grand plaisir ! 😉 Un petit weekend à Londres, c’est une superbe idée. Il va falloir me dire ce que tu trouves de bon !! Zita, indeed a very small piece, but nothing short of delicious ! Edd, gosh, another person of similar tastes underwhelmed by Curley. That’s too bad. I was really hoping to taste Paul A Young’s stuff too, especially his Maldon Sea Salt Bar and the Sea Salted Caramel Bar. Oh, and his Dark Sea Salted Rocher too. Wait, and his Fruit and Nut Cobbles… 🙂 Melt definitely has inventive flavors, do you know the caramel bar here ? Worth trying for sure. Thanks for sharing Edd. 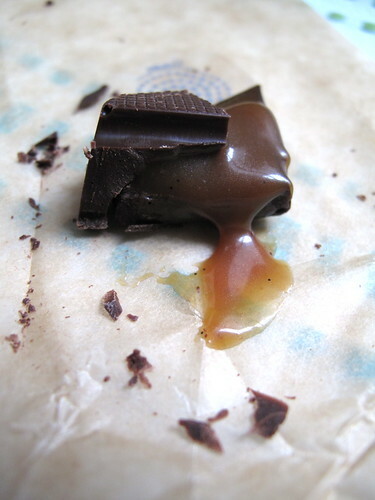 Okay, Noirmoutier sea salt caramel is my territory and who loves it better when it is wrapped in chocolate than I? You? Ha! Fabulous write up, my dear, and now I am tearing into the stack of chocolate I brought back with me from London. Oh, btw, any Debotté left? Hmmm? I think I now need to go and buy myself a box. 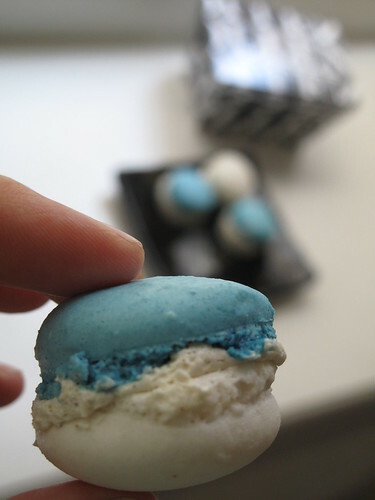 Craving…. 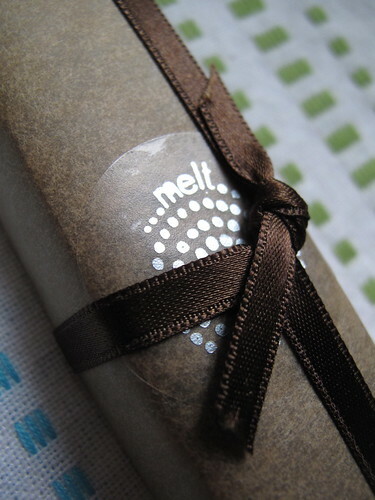 I havent tried the caramel at melt, the last bar i had was blackerry and cinnamon in milk chocolate, which was really good. 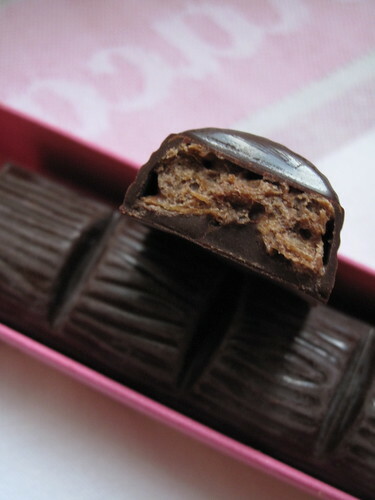 I really should try more from Paul A Young but im always drawn in for another caramel. I really want to try his brownie too, ive heard its one of the best around but i wasnt a fan of the marmite truffle, not to my tastes. 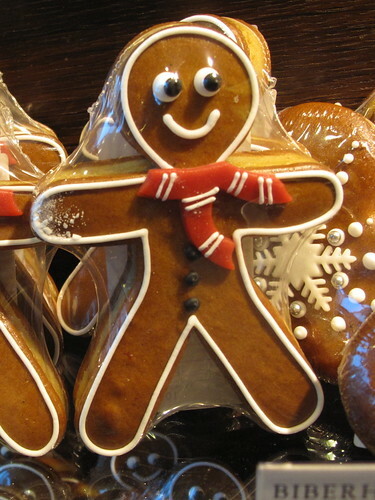 Oops… just made a huge mistake by looking at your pictures while hungry! Thanks! 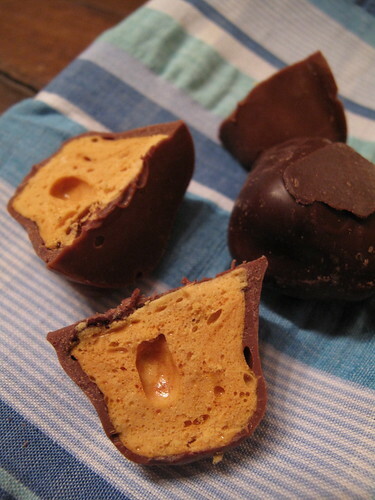 I’ll have to check these out – salted caramel sounds pretty intriguing! Wow…some really nice choices here. 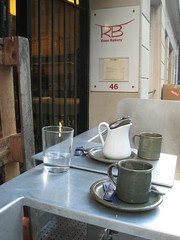 Next time round you should definitely check out Red Star Chocolate- they are amazing. Too bad that the William Curely experience did not meet your expectations. He is easily my favourite British Chocolatier, I really think his stuff is a cut above the rest. But that’s just me. 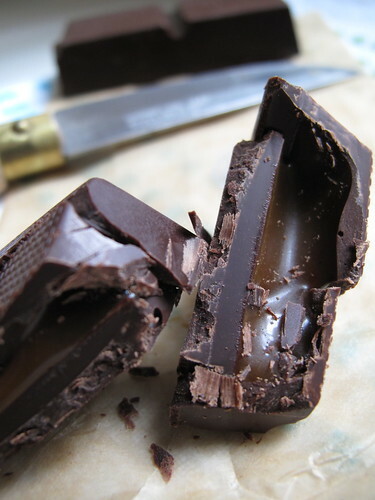 The bloom on the chocolate is a bit dissappointing, but they do work with a type of chocolate (Amedei) that is particularly unruly when it comes to tempering (it’s the thickest, gloopiest chocolate I have ever worked with). Melt make some good ones too. I really like their Olive Caramel bon bon. 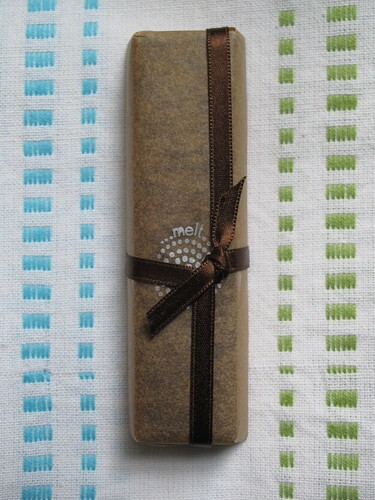 And for Artisan du Chocolat- just love, love the single origin Bali Bar. iain, oh la la, dangerous idea ! ha ha ! First off…I must say that your photography of the caramel ozzing out of the chocolate is mouth watering! How quickly did you eat the chocolate after you shot the photograph. It would have been most difficult for me to shoot a piece of all this exquisite chocolate because I would just want to let it melt in my mouth! What a trip to London! 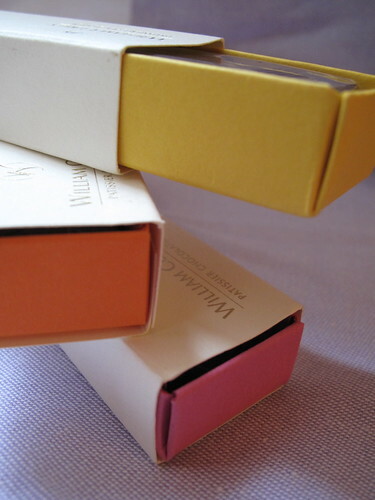 I do remember having the most wonderful “high” tea but never even knew about how good their chocolates were! The London roundup is just fabulous!! 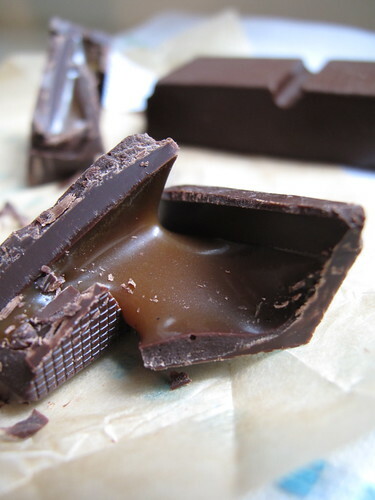 Thank you for giving me my chocolate fix….the caramel is dripping from my lips…..oh those calories…how wonderful!!!!! 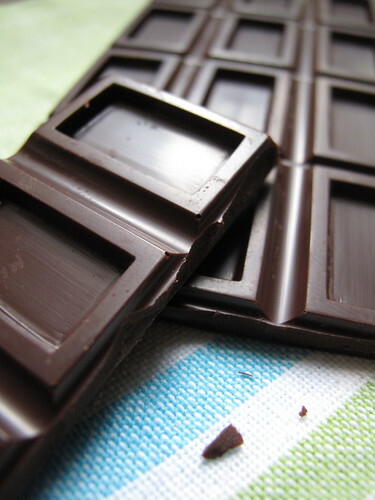 A seriously, comprehensive and delectable list of chocolates. I’m suddenly hungry! Give me any flavour of Sprungli without Eier! The best ever! BoB, sorry you were disappointed as well. Guess we are not alone in our reactions to Curley’s stuff lately. Seems a few other readers agree. Lani, thank you so much ! Let’s just say, after I took those above photos, the chocolates didn’t stick around too much longer ! 😉 That caramel, I had to “clean” it all up of course ! So glad you enjoyed your chocolate fix here. Have I just had a shot of sugar or what? Now, very sorry to hear you didn’t make your entire list, but fortunately you are not far away and can return to complete that another time, I’m sure. Those little salted caramel balls are like those once I mentioned were available across the road from my work in Brisbane. But I don’t recognise them as being from artisan du chocolat London. For some reason I thought they were German. I will have to go in today and check and report back. But in the meantime, have you heard of other places making similar ones? Still on the subject of salted caramel, I fear that in my journey through Sydney – and in quizzing Y & Lorraine while there – that there is not much salted caramel around here now. Come and gone. Seems we’re now looking for the next big thing to adopt. My friend from Melbourne who was with me has just stumbled across salted caramel in Melbourne and was bitterly disappointed we couldn’t fuel her new found love while trekking around Sydney. Yes, please share your honeycomb recipe. Love it. There’s quite a divide between Crunchie and Violet Crumble fans, too. Have you tried the Violet Crumble? Speaking of chocolate 1 x sea salt chocolate Lindt bar already devoured. How good is that stuff? 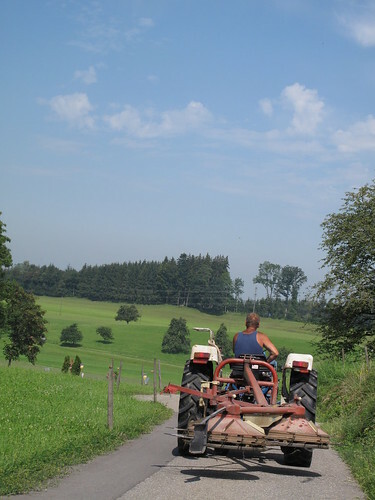 So I know I will come here again and again – an awesome and very sweet roundup. However my question to you sporty is when the hec did you do this and more importantly where was I? I mean we were together for most of the trip. It seems you were sneaky and gathered your loot without me!! Love you and think of you everyday as I take a bite from the chocs you brought in London! Oh, I had never heard of Violet Crumble until you mentioned it. But of course I am curious now… ! 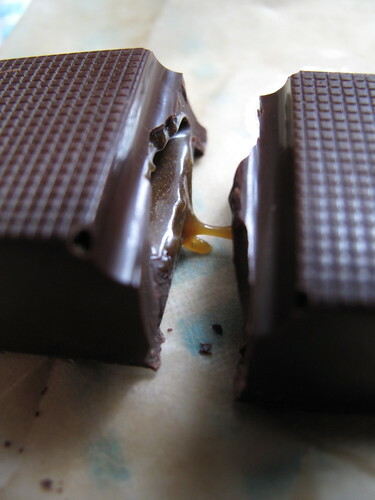 And the Lindt dark fleur de sel bar – YES, it is that good. 1 for 3… I’d hide the other 2 if you want them to last through the weekend ! Meeta, ha ha ! This was my sweet distraction while waiting for you to arrive in London. I still have lists of places to visit (and many things to taste), so next time we’ll do it together. How’s that ?! 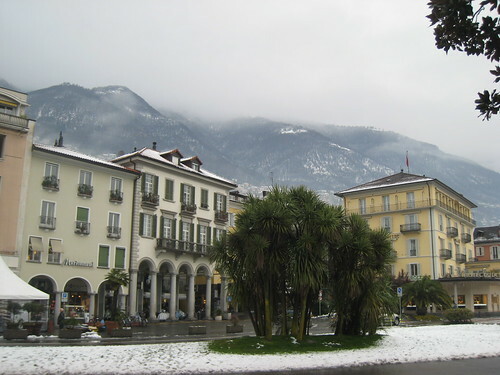 🙂 Love thinking of you in Weimar savoring your Swiss chocolates, miss you ! Kerrin, wow, I swear this post just added a few more unwanted grams to my derriere! That’s some serious chocolate to check out, how about I go to London for you?! 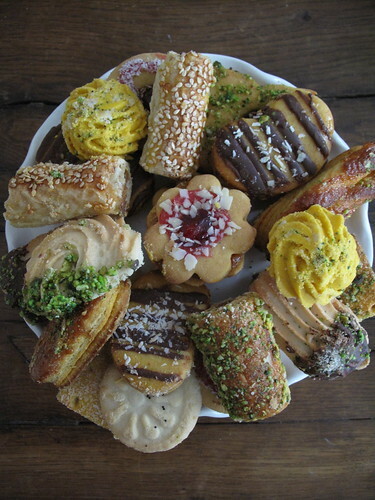 I missed Ottolenghi too during the weekend… Great to meet you there. And the tube in London? Oh how I had forgotton how long it takes to get anywhere. I figured on leaving 1 hour before check-in to get to St Pancras from Gloucester Road and still nearly missed the train! But then thanks to my other half I was dragging (and cursing) a folding bike, in a bag with tiny wheels. “What do you want from London chèri, some more Shredded Wheat…?” No, it was, “Can you bring me back a bike?”. Er, hmm. You are one baddass chocolate addict, Sporty 😉 What a fab roundup of Chocolate London, even if I am more of a savoury girl! Those liquid salted caramel chocs at Gordon Ramsays were always the best thing about a meal there – I would polish off the entire plate! And William Curley is spectacular – I went to a dessert class there where we made one of his creations from scratch which was faulous. Only me and Johanna in the class, so really hands-on. If you are desperate for a fix of anything, send me a shopping list! 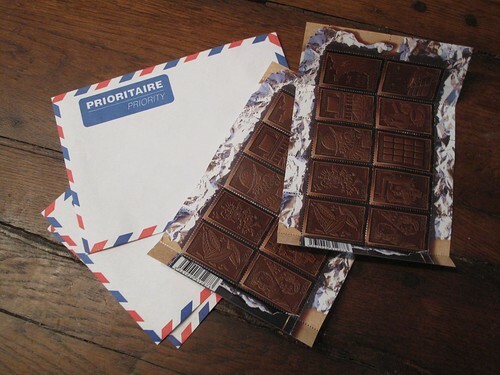 Sunita, the post IS helping – it’s telling you that you are right to be craving chocolate – so go get some !! ha ha ! Great round-up Kerrin! I’ll have to follow in your footsteps and check out some of these places. And of course, you know what other stop to add to that list next your across the channel… right?! I knew you were going to do a chocolate round up!! 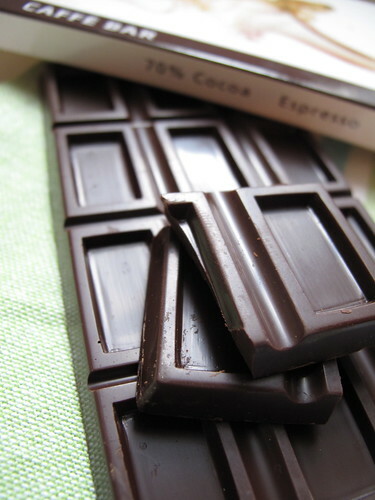 I need a chocolate bar pick-me-upper right now. We just spent a solid 7 hours (10 pm-5 am) in the hospital ER with our newborn baby 🙁 She has impetigo 🙁 Need. Chocolate. Now. bethany, thanks ! And yes, you totally have to check out these sweet spots. Meanwhile, I noticed tons of chocolate shops on our stroll around Brighton (Hotel Chocolat, Choccywoccydoodha [what a name], Montezuma’s, Audrey’s) – which might, just might, be that “other stop” !?! 🙂 But of course !! jen, I really hope by now you have gotten that much needed chocolate boost – and a good night’s sleep. Sent you an email, and sure hope your daughter is doing better now. Sweet thoughts coming to you all from here. valentina, oooh how interesting ! Nope, never heard of him, but I am certainly intrigued now. Thanks so much for sharing. Have you ever tried his chocolates ?? I read about your love for chocolate via Twitter, but this proves that you are a pro at searching out the most delicious chocolates wherever you go. The photos are fantastic and oh so seductive (to me anyway). It’s a bad idea to look at this first thing in the morning. Now I want to skip breakfast. Great post. Kerrin, not yet but a friend of mine has been telling me about him for a while. Apparently he does not yet have a shop and still works as a patisserie chef I believe. I am looking forward to trying it.There is a lot of controversy around his technique an finished product. Ken (june 19) is right: you are a pro at searching out the goods, at the the lay out and photography; seductive indeed. 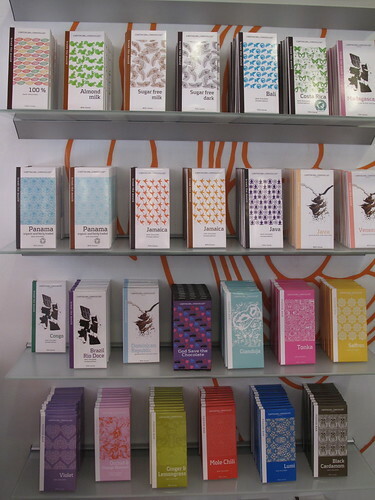 When I am next in London I will certainly visit every chocolate shop on your list. Wooohoo! Coming off a week of vacation, this is the perfect pick-me-up needed to get myself together and go do some field work today! I knew I’d have a sweet post to look forward to. Like the rocket ship and especially all the oozing caramel. Great photos. My vacation was mostly chocolate-free (sad), but I do get to look forward to the chocogoodies I’ll receive in a few weeks after some friends make a trip to Montréal (glad). I have a route all planned out for them…. yum! Looking forward to a date with dates. Ken, it’s fun going back and forth with you on Twitter – and I guess my tweets do tend towards a certain theme ! Glad you stopped by here too, thanks. And yes, I can’t seem to go anywhere without that sweet radar on 😉 But oops, I didn’t mean to ruin your breakfast, ha ha ! valentina, hmmm, I am even more intrigued now ! Controversial techniques… will have to read up more. Let me know if you get the chance to try his stuff for sure. And again, thanks for sharing. 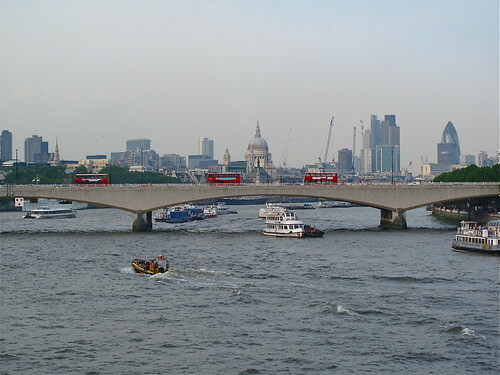 Duncalator, so when is the next trip to London ? 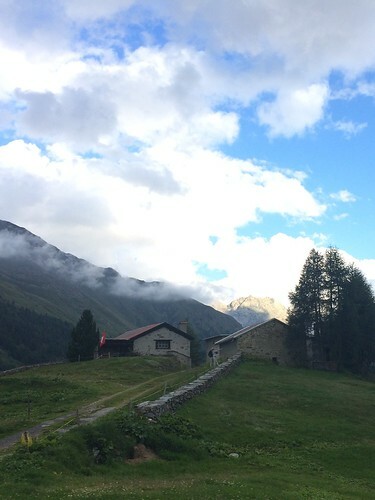 I would say these places here are worth the trip themselves ! Emma, thanks and welcome back. But there is a definite contradiction above: “chocolate-free vacation.” What kind of a vacation is that ?! 🙁 Sad indeed. But ooh, I wonder what kinds of goodies you requested from Montréal… aside from maple syrup (yum) and poutine (yuck)… there’s bagels and guess what – tons of excellent chocolate shops. I remember years ago (when we lived in Boston) bringing back dark chocolate made with maple syrup and local ingredients like that. Oooooh, wish I had some friends heading that way too ! What a fabulous post Kerrin! What a smorgasbord of the delicious dark stuff. Yes we seem to have moved on from salted caramel here. I don’t know what it has been replaced with here. 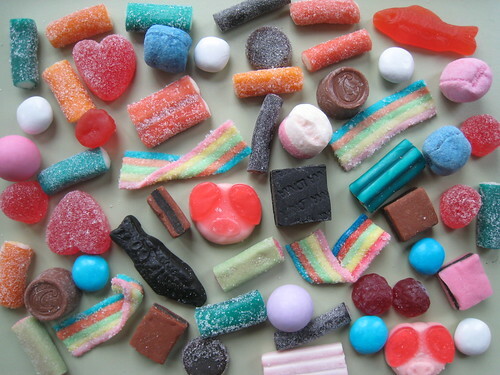 If anything perhaps savoury items with sweets (which is kind of similar to salted).